Hundreds of scientists from around the world are patiently awaiting the start of a billion-dollar experiment that, in a scene straight out of a science fiction movie, will fire a beam of tiny neutrinos from a laboratory near Chicago that will carry the subatomic particles a mile underground and 800 miles away in the Black Hills of South Dakota. By itself, the $300 million investment for the experiment at the Sanford Lab in Lead represents the largest single project in the history of South Dakota. And, project advocates say the experiment has the potential to advance scientific knowledge and yield technological advancements on a par with the race to the moon in the 1960s. At its core, the Long-Baseline Neutrino Facility (LBNF) and the associated Deep Underground Neutrino Experiment (DUNE), will send a beam of neutrinos through the earth from Fermi National Accelerator Laboratory near Batavia, Ill., to the Sanford Lab in western South Dakota, according to the U.S. Department of Energy. Having very little mass and no electric charge, neutrinos pass through ordinary matter nearly undisturbed — they can pass through 100 million miles of lead without stopping — and they continuously pass through the earth and our bodies, scientists say. In Illinois, project leaders plan to build four structures on the Fermilab site. One building would be connected via a vertical shaft to an underground hall about 200 feet below the Fermilab. The project also would include the construction of a 50- to 60-foot-high hill on the Fermi site as part of the facility that would create the neutrinos, according to the DOE. In South Dakota, project leaders plan to construct one building at the surface adjacent to an existing building near the Ross Shaft. About one mile underground, the project would include three large caverns, each about 60 feet wide and 500 feet long. These caverns would provide space for utilities and four large detectors filled with liquid argon to detect the neutrinos fired from Fermi, Headley explained. Particle detectors at Sanford Lab would record neutrinos from the Fermilab and measure their properties. They also would look for neutrinos from a supernova and search for signs of nucleon decay. With the data, scientists aim to learn more about the building blocks of matter and determine the exact role that neutrinos play in the universe, he said. Michael Weis, Fermi site office manager for the DOE, said on Friday that the DUNE international collaboration includes 776 scientists from 144 institutions and 26 nations, and it is still growing. Years in the making, scientists behind the project have exhibited remarkable patience in its development, and must remain patient to realize the potential of the experiment. According to Weis, the preliminary schedule estimates facility construction could start at the Sanford Lab as early as 2017, and be completed in the mid-2020s. Installation of the experiment into the facility could begin as early as 2021 and continue for a few years beyond this, he said, while the experiment duration is estimated to be 20 years. LBNF/DUNE is being funded by the DOE, as well as the international cast of collaborators. Headley said the significance of the experiment to the scientific community, the State of South Dakota, and the nation, could not be understated. Last year, an important DOE scientific review panel called the “Particle Physics Project Prioritization Panel,” or P5, identified the experiment as a top priority for U.S. particle physics, recommending it be planned as an international effort in order to achieve the greatest scientific capability, Headley explained. DUNE represents the convergence of several formerly independent worldwide efforts around the opportunity provided by a new neutrino beam facility planned at the Fermilab and by the new and significant expansion at Sanford Lab, he said. If you happen to have some extra xenon lying around – say about 1.8 million liters – officials at the Sanford Underground Research Facility would like to talk to you. That’s the amount of the colorless, odorless element that makes up only 0.0000087 percent of the Earth’s atmosphere that scientists say will be needed for the deep underground laboratory’s $50 million to $60 million LUX-ZEPLIN experiment, so the Sanford Lab is going to start stockpiling it soon. At its annual meeting Thursday, the South Dakota Science and Technology Authority unanimously approved a loan from the University of South Dakota Foundation and authorization for its executive director to procure up to 500,000 liters of xenon. Two years ago, xenon was priced at nearly $25 per liter, meaning the necessary gaseous element of atomic number 54, obtained through the distillation of liquid air, would have set the Science Authority back a cool $45 million. Fortunately, the price has dropped significantly since then. Headley said late Thursday that the Science Authority had secured the first 500,000 liters at a cost of $6.25 per liter and the remaining 1.3 million liters would cost $5.50 per liter. Consequently, even with the price reduction, the xenon will likely cost the Science Authority nearly $10.3 million. Initially, the Science Authority will purchase 1.5 million liters, or about 80 percent of the 1.8 million liters the experiment will require, Walters said. The xenon will be delivered over the next two-plus years and when it is purchased, it will first go to the U.S. Department of Energy’s SLAC National Accelerator Laboratory in Menlo Park, Calif., where it will be purified. Then it will be shipped to the Sanford Lab to be placed in the detector sometime in 2018, she explained. Discovered in 1898 by Sir William Ramsay, a Scottish chemist, and Morris M. Travers, an English chemist, shortly after their discovery of the elements krypton and neon, xenon was used in the Sanford Lab’s original Large Underground Xenon experiment known as LUX. In October 2013, more than 100 science enthusiasts and government officials gathered at the Sanford Lab to receive initial findings of the LUX, while hundreds more from around the world joined via webcam. In that complex three-month trial involving particle physics, scientists sought to detect mysterious dark matter particles previously observed only through their gravitational effects on galaxies. Nearly a mile deep in the bedrock of the Black Hills and shielded from vast amounts of cosmic radiation that constantly bombard the earth’s atmosphere, the LUX was comprised of a phone booth-sized titanium tank filled with nearly a third of a metric-ton (370 kilograms) of liquid xenon cooled to minus 150 degrees, scientists explained. The detector was further buffered from background radiation by its immersion in a 72,000-gallon tank of ultra-pure water. Now, scientists around the globe are awaiting the start-up of the much larger 60-ton particle detector known as the LUX-ZEPLIN or LZ, which will be approximately 30 times larger (10 metric tons or 10,000 kilograms of xenon) and 100 times more sensitive than the LUX. And, it’s going to take quite a bit of xenon to make that happen. LEAD | With the help of a few friends, the South Dakota Science and Technology Authority will spend more than $10 million on xenon this year, a hefty amount for a gaseous element that a non-scientist knows so little about. So, we asked Sanford Underground Research Facility scientist Markus Horn, who worked on the LUX and is now collaborating on the LUX LZ, the next-generation dark matter experiment, what makes xenon critical to its success. Q: How is xenon extracted from the earth’s atmosphere? A: Xenon is a trace gas in the atmosphere and is extracted as a by-product at the separation of air into oxygen and nitrogen. Q: Why is xenon worth so much money? A: It’s rare in the Earth’s atmosphere; only about 1 part in 20 million. Q: Why is xenon critical to the LUX LZ? Succinctly, what does it do? • It is a liquid noble gas detectors are easy to scale, LUX to LZ, etc. Q: Why does it have to be so cold (-150 degrees)? A: As with any material, it can be in different states (gas, liquid, solid). Depending on the element, this happens at different temperatures and pressures. Xenon is a gas at room temperature and atmospheric pressure, you need to compress it or cool it to approx -100C to force it into a liquid. I guess that’s simple chemistry. LEAD | An experiment now in its infancy nearly a mile underground has the potential to put this former gold mining camp on the map as the home for groundbreaking science that could help unravel the mysteries of the universe. Plans for the groundbreaking project solidified some now that Congress is considering mark-ups in President Obama’s fiscal 2017 budget, which begins Oct. 1, that include $45 million for start-up of the Deep Underground Neutrino Experiment at Lead’s Sanford Underground Research Facility. The project received another dose of Congressional support last week when U.S. Sen. John Thune, R-S.D., added a provision to a sweeping energy bill that would create a new Congressional subcommittee within the National Science and Technology Council specifically focused on high energy physics projects like those underway in Lead. 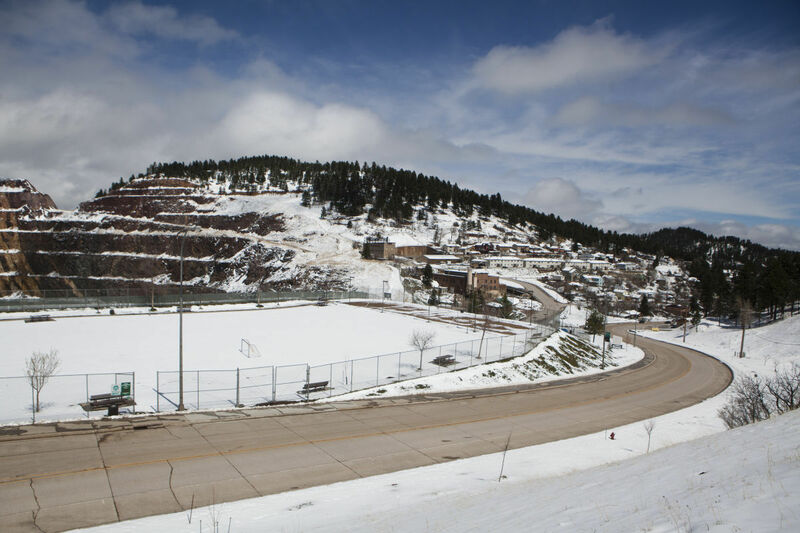 And the project could alter the look of downtown Lead, where a proposal has been made to build an elevated conveyor system across Main Street to carry an estimated 800,000 tons of waste rock from the lab site into the open cut at Homestake Gold Mine. While the two acronyms — DUNE and SURF — seem like attractions of a beachfront holiday, they in fact represent man’s most serious attempts to date to understand the origins of our planet. The proposed DUNE project alone involves a collaboration of more than 800 scientists from roughly 150 institutions in 28 countries and with a price-tag estimated at $1 billion to $1.4 billion, about half of which would be spent in the Black Hills. That would make it the largest, most expensive project in South Dakota history. “I don’t think you could state the importance of the project too strongly,” said Mike Headley, executive director of the South Dakota Science and Technology Authority. “This is an international science mega-project. If you look at the current suite of experiments around the world and those planned in the future, this would be the largest in scale. “To draw a parallel, it would include international involvement on the scale of the Large Hadron Collider in Cern, Switzerland, where the Higgs Boson was discovered,” Headley added. The Sanford Lab, occupying the massive 8,000-foot deep former Homestake Gold Mine which operated for 125 years in Lead, and the SDSTA have spent years planning for the DUNE, to be placed at the Long Baseline Neutrino Facility construction site at the 4,850-foot level. In fact, private, state and federal funds are being used to refurbish the Ross Shaft, a $30 million project begun in August 2012, now 70 percent complete, that’s on track for completion in September 2017, Headley explained. Reconstruction of the Ross Shaft is critical to making room for the DUNE, which would require contractors to excavate 800 million tons of rock — nearly twice that removed from Mount Rushmore in the 1927-1941 carving of the four presidential portraits. All of that rock has to go someplace, so SURF has already reached an easement agreement with Barrick, the Canadian-based owners of the former Homestake Mine and its massive Open Cut, to deposit the excavated rock in the open pit. But, for some, getting it there has become an issue. SURF recently requested an easement from the city of Lead allowing it to build an elevated, covered conveyor spanning Main Street near Gold Run Park to transport the rock to its final resting place in the open cut. Representatives of SURF, including Headley, have appeared at the last two Lead City Commission meetings to provide project overviews and answer questions and concerns. “I do have a few concerns regarding the decision to construct a conveyor belt across a major highway that is a main thoroughfare for our community,” said Commissioner Denise Parker. Many of those concerns, including potential dust, debris and noise, have been brought to her attention by local residents, she said. Headley said excavation and onsite construction during the peak of activity in the early 2020s, could bring 180 new workers to the SURF on a daily basis, including construction contractors, scientists and other partners. Those workers would not necessarily be added to the 130 employees the Science Authority currently employs at the SURF, he said. Parker said she would welcome new jobs in a town depressed since the closure of the Homestake in 2002, and the potential for the DUNE to put her community on the map of ground-breaking science. Mayor-Elect Ron Everett, contacted last week, said he believed SURF’s plan for a conveyor was preferable to another option SURF explored to remove the tons of rock that could lead to 40,000-60,000 round-trip truck loads to move the rock to another site. Everett, who recently retired as an executive with mining company Wharf Resources, said he views it as his mission to have Lead capitalize on all of the employment, housing and economic development potential of what the DUNE can bring to the Northern Hills. Headley said city officials and others naturally gravitate to the economic development, employment and financial aspects of the DUNE. But, he said local residents shouldn’t discount the educational opportunities that students at schools and universities throughout the South Dakota and the U.S. would experience from the collaboration of scientists and advanced experiments coming to the Black Hills. “Folks may not think what could potentially happen here in the next few years in terms of educational opportunities, and the advancement of STEM (Science, Technology, Engineering, Mathematics) education for grades K-12,” Headley said. The first two major physics experiments at the Sanford Lab are 4,850 feet underground in an area called the Davis Campus, named for the late Ray Davis. The Large Underground Xenon (LUX) experiment is housed in the same cavern excavated for Ray Davis’s experiment in the 1960s. In October 2013, after an initial run of 80 days, LUX was determined to be the most sensitive detector yet to search for dark matter—a mysterious, yet-to-be-detected substance thought to be the most prevalent matter in the universe. The Majorana Demonstrator experiment, also on the 4850 Level, is searching for a rare phenomenon called “neutrinoless double-beta decay” that could reveal whether subatomic particles called neutrinos can be their own antiparticle. Detection of neutrinoless double-beta decay could help determine why matter prevailed over antimatter. The Majorana Demonstrator experiment is adjacent to the original Davis cavern.